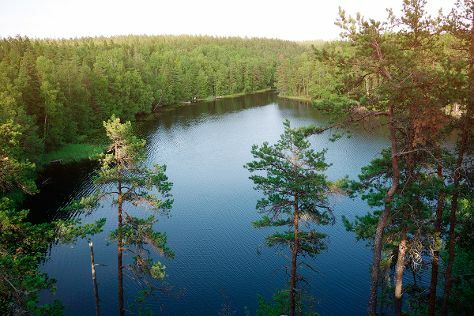 Visiting Nuuksio National Park and Teijo national park will get you outdoors. Sea Fortress Suomenlinna and The Esplanadi Park are good opportunities to explore the local culture. Get out of town with these interesting Helsinki side-trips: Sipoonkorven Kansallispuisto (in Vantaa), Arboretum Mustila (in Elimaki) and Porvoo (Runeberg Park, Castle Hill, & more). There's still lots to do: take in the spiritual surroundings of Rock Church, explore the galleries of Laurinmaki nature and culture area, Crofter's Museum, steep yourself in history at Seurasaari Island and Open-Air Museum, and identify plant and animal life at Riverside Park. For photos, maps, more things to do, and other tourist information, read our Helsinki journey maker tool . If you are flying in from Australia, the closest major airport is Helsinki Vantaa Airport. In May, daily temperatures in Helsinki can reach 18°C, while at night they dip to 7°C. Wrap up your sightseeing on the 31st (Fri) early enough to travel back home.